Limited Time Offer Sale Price Valid thru June 28th! 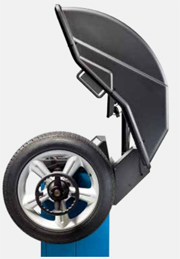 Automatically detects rim width and starts the measuring run as soon as the wheel guard is lowered, with a time savings of 30% compared to manual input and reduced user error. Pinpoint red laser provides fast, accurate, easy positioning of adhesive weights on the wheel, identifying exact weight placement locations for increased accuracy and productivity. Graphical user interface employs touchscreen technology and improved ergonomics to allow for fast, intuitive control of every balancing operation. Flat back panel allows for placement directly against a wall, reducing footprint to save space in the shop. With the included cones or the optional stud-hold flange accessory, clamping is fast and easy. Rim Diameter - Manual Entry 8" - 30"
Rim Diameter - Semi-automatic Entry 8" - 32"
Rim Diameter - Smart Sonar 3" - 20"
Maximum Wheel and Tire Assembly Weight 154 lbs. Fast, Accurate and dependable balancer. The 7400L can handle a fast pace shop with accurate measurements on your tires. This machine will save you time and money because of the dependability. The buttons on the display board is tough and can handle the shop environment. The sape arm is accurate. The sonar reads perfectly. Every balancer is made in the USA and pre-tested with a check spin after calibration to ensure quality before leaving the manufacturing plant in Arkansas.